Pang Champion talaga! 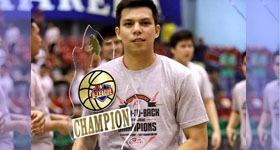 PBA D-League 2017 trophy, a combination of Acrylic, metal and wood. The combination shows a good contrast in texture and mass. The material for the main body of the trophy is a finely cut smoked acrylic which supports the 3 elements made in brass engraved. The base of the trophy is made of wood...Continue here. Producing Championship Belt entails a process that involves the application of various types of skilled labor. The design provided by the client is converted to vector files in order to prepare it for metal engraving. Workers handling chemical engraving should have the mastery of timing and care in order to avoid costly errors. Continue here. 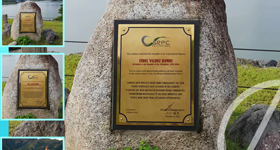 An elagant brass marker on stone at the the San Roque Dam overlooking the reservoir, by Greatest Amore Inc., made to honor former preseident Fidel V. Ramos. Written in the marker says "For his vision and determined political will that resulted in the construction of the San Roque Dam." The 200 meters dam is located around the provinces... Continue here. 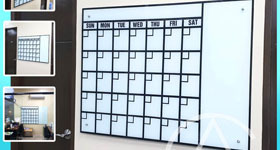 Tired of your messy whiteboard calendar? Having a hard time drawing its lines, to keep it straight and neatly connected? Not to mention erasing your old schedules in the boxes while keeping the lines intact. It’s a cumbersome work that takes a significant share from your working time... continue here. 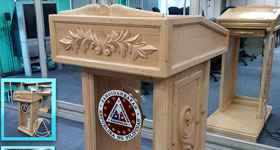 This classic wood podium made for the Sandiganbayan perfectly fit the special court. Wood is classic! Wood podium is special in many ways for it is a product of careful craftsmanship. The center and side wood curvings were meticulously sanded by hand to achieve the desired curves... continue here. Our Writing Glass Board is a black board with class. 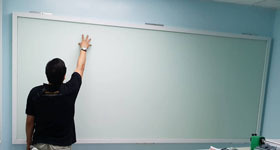 Black board is boring and reminds you of your grade school classroom. A writing Glass Board is a must for your company’s conference room if you want to create a corporate ambiance. Size is customizable according to the space available... continue here. You don’t just sell your products or services, you sell your brand too. The quality of your logo will affect your market’s first impression on your brand. While quality, details and time are real testaments to the products and services you offer, your logo must justify to these testaments too. Greatest Amore Enterprise makes colorized acrylilic... continue here. There are endless possibilities for trophy designs, especially with materials like acrylic. This elegant 3 dimensional trophy is perfect for awarding companies that strive to build their own brands. Four perpendicular acrylic letters meet at the center forming a stable structure. Two pairs of letters were identically reproduced. Lines and curves were... continue here. 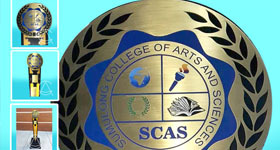 A beautiful ceremonial College Mace produced for the Sumulong College of Arts and Science (SCAS) in Antipolo, Rizal. Standing 4 feet tall, it is a perfect symbol of the college’s honor, excellence and dedication. Made from wood and brass, a good combination that shows contrast in texture – or the harmony between opacity and luster... continue here. Get a free quotation and talk to us for product and price adjustments. We hire and train partners.